Mother Teresa once stated, "Each one of them is Jesus in disguise." Her statement highlights her ministry of helping many who others walk past or ignore. 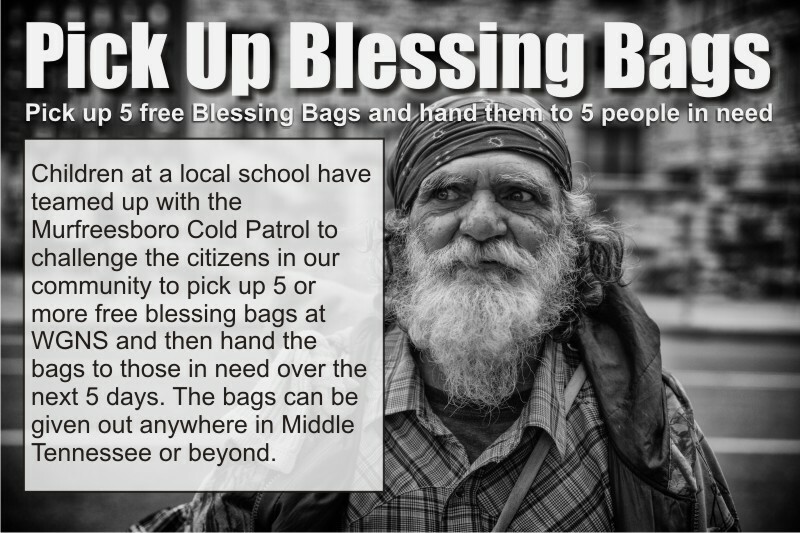 The children at a local school have teamed up with the Murfreesboro Cold Patrol and WGNS to challenge the citizens in our community to pick up five free blessing bags and then hand the bags to those in need over the next five days. If you see someone on the streets of Murfreesboro or anywhere in Middle Tennessee, you can give them one of the bags. Rion Flowers and Gifts in Murfreesboro will also be handing out bags over the next week. When Rions heads out to make a flower delivery, they will be armed with the bags that were prepared by the school children to hand them out if they see someone on the streets in need of basic supplies. Pick up five free blessing bags at WGNS. The Good Neighbor Station is at 306 South Church Street in Murfreesboro next to the city police station. After you hand out five bags, you are encouraged to stop by and grab five more.